Camping near the Kaweah is hardly a hard-core back country endeavor. Save your featherweight gas stove and creative waste management systems for another day and roll up that massive Coleman sleeping bag, throw your heaviest cast-iron pan in the trunk, and plan an extrvagant meal–you’re headed to a car camper’s paradise. Hope your neighbors are quiet. 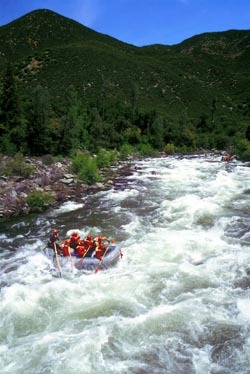 The campground is conveniently located right on the bank of the Kaweah River. This small, privately owned RV park has tent camping as well as 3 vacation cabins. Amenities include RV hookup, fire pits, picnic tables, showers, flush toilets, and dump station. The cabins house up to 4 people and all have AC, cable, and linen service. Painless!! This campground is nestled among citrus groves just off Hwy 198, and has tent and RV camping. A rec room, mini-mart and laundry are available in the main building. Guests can also use their outdoor pool, playground and volleyball court. Other amenities include cable, RV hookup, dump station, hot showers and flush toilets. Mini-mart? See what we said? Hardly a survival expedition . . .
All campgrounds but two inside the Park are on a first-come basis. Only Lodgepole and Dorst Creek campgrounds take reservations. Be advised that road closures inside the Park can occur in early Spring so plan ahead and call the Park Service for current conditions and information before you head out on your adventure. The entrance to the park is only a few miles away from the Kaweah River, but a world away from urban sprawl, strip malls, and big box stores. Leave your Blackberry at home and try to process how big Sequoias can grow when we don’t cut them down . . . It may not have a disco ball or a DJ, but the most popular place to camp along the Kaweah is at Dave’s Three River’s Hideaway. River guides, kayakers, and rafters hang out, play Bocce Ball, barbeque, and one-up each other with stories from the day. If even an air mattress, solar blender for margaritas, and a camp chair with a foot rest doesn’t make camping palatable to you, there are still plenty of options for places to crash before or after your Kaweah river trip. This large cahin hotel is just off of Hwy 198. All rooms have Internet access and Wi-Fi is available in the lobby. If it’s a nice day, you can chill on the sundeck by the pool or in the hot tub. Complimentary continental breakfast is included. We can’t vouch for how tasty it is though. As you approach from the west, you can’t miss the Sierra Lodge on your left lined with palm trees. Located only about one minute from the Three Rivers Hideaway Campground, this accommodation offers motel style rooms, some of which have a fireplace, kitchenette, or private patio. Free wireless is available as well as an outdoor pool (in case you don’t get your fill of swimming in the river) and small quiet library. This small working ranch is located on the west side of town, about 10 minutes away from our meet place. 18 motel style rooms, 2 two-bedroom units and 5 cottages surround a spacious lawn area with pool, volleyball court, and playground for children. Amenities include complimentary breakfast, laundry room, free movie rental, in-room TV, refrigerator, microwave, and phone. This Lodge is just below the entrance to the Sequoia National Park, about a 10 minute drive from our meet place and with views of the Kaweah River and mountains from a grassy picnic area. 11 motel style rooms and 1 cottage (for larger groups) feature air conditioning, refrigerator, microwave, phone, and back doors to a patio (downstairs) or balcony (upstairs). Free breakfast basket included. This motel offers 11 rooms and 3 cabins in a pleasant garden setting with swimming pool and gazebo. All rooms have TV, AC, and coffeemaker. Cabins have kitchens, private patios, and a fireplaces. It will only take you about 2 minutes to drive to our meet place from this location. Choose from a motel-style “River Inn” room, 4 riverfront cabin or rental house at this establishment. It is only a 5 minute drive from our trip meet place. Cabins have a full kitchen, and patio with a BBQ for you to use. “Breakfast in the bag” is delivered to your door every morning if you choose a River Inn room. Other amenities include cable TV, phone, refrigerator, microwave. One of the cabins even has a private hot tub for relaxing in after a day on the river! This website directs you to lodging within and nearby Sequoia, Kings Canyon and Yosemite National Parks. Use the link for more information and a reservation form. In addition to the accommodations mentioned on this list, there are many national chain hotels in the town of Visalia, just along Hwy 198 and about 30 miles away from our meet place.